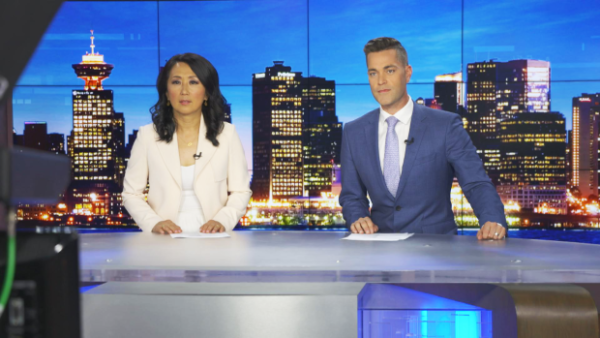 Beginning Aug. 23, Lee and Roberts will be co-anchoring CTV Vancouver’s flagship nightly newscast, while continuing to deliver the same hands-on reporting that viewers have come to know and trust. CTV Vancouver news director Les Staff said the announcements mark the next big step in the station’s evolution, which has also featured new set designs and updated on-set technology. Lee’s trailblazing career began almost 30 years ago in Victoria, where she became the first Korean-Canadian newscaster in B.C. history. She has since become a household name in the Lower Mainland, earning a reputation for in-depth investigative stories covering everything from bogus health claims to money laundering in B.C. casinos – coverage that aired years before the government’s recently announced crackdown. Since bringing his talents west, he’s received multiple journalism awards and nominations for chasing the kind of stories that matter to B.C. residents, including an Edward R. Murrow Award he won for an exclusive report on animal abuse at dairy farms in the Fraser Valley. Most recently, Lee and Roberts were honoured together for co-anchoring CTV Vancouver’s coverage of the worst wildfire season in B.C. history. Both of the new 6 p.m. anchors have earned audiences’ trust with hard-hitting, in-depth and accurate reporting, and will continue using those same journalistic skills in their new roles. “It’s an honour to be able to anchor CTV News with Scott. I love his energy, his powerful communication skills and his drive to find out more about a story,” Lee said. I’m sure their choices have been thoroughly focused grouped and tested. Strikes me as kind of underwhelming but I haven’t watched a local newscast in over a decade so I’m not the target audience. I would say it’s an improvement over the previous duo so hopefully audiences agree. I’m curious who is still watching these days. Probably mostly 55+ but the audience must be small. Wow, new (recycled) co-anchors, new set & new technology…that’s gonna make me move from Brand A to CTV!!! BORING! I rarely watch the news these days anyway. Most of it is nothing but fake propaganda and puff pieces Not which station is worse? CTV or Global? Wow what a schock,will never catch Global,had the right team before cheapskates. Very big improvement. Most news coming from Vancouver outlets are Liberal dominated. Nice to see a TV station present BOTH sides of a story. A BIG step up from “blondie” to Mi Jung. Finally, a real journalist at the anchor desk !